Chef Keni is one of the country�s most respected experts on simple, honest food prepared with fresh, local and seasonal ingredients. 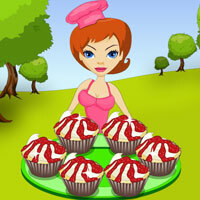 Today she is going to teach you how to make Cherry Cupcakes recipe. You need to follow Chef Keni step by step bringing the required ingredients and tools to the correct places. The better you play these games, higher the taste will be.